When they first saw a baby bear digging about near their trash heap, the men who live and work at an oil and gas field in the Tomsk region kept a wary distance, approaching only for a hurried photograph or two. 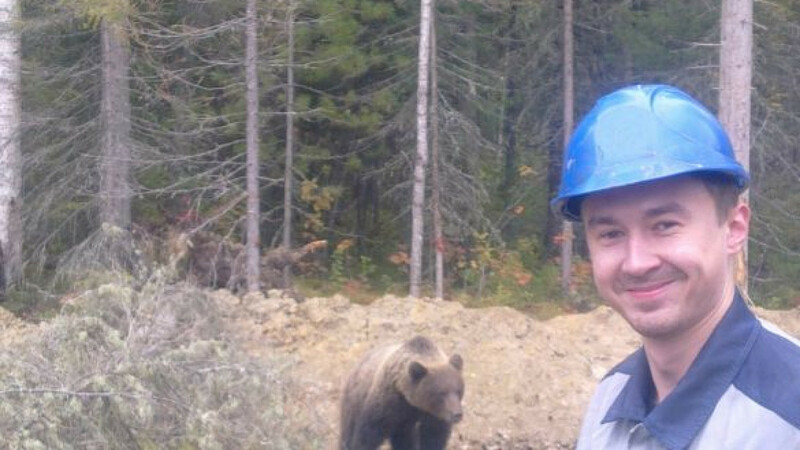 But in the days since the cub was first spotted on Sept. 12, the employees of TomskGazpromGeofizika have grown quite fond of their unlikely ward. "It's a bit scary, of course, he's a wild animal after all, but seeing as he doesn't touch anyone and basically shows no interest in people, bit by bit everybody got used to him," a company employee told Interfax. At first they did not feed him, thinking that he might leave the site in search of sustenance, but by now the cub is on a comfortable diet of rolls and pieces of salo, which is cured pork fat, from the settlement's cafeteria. The bear is about six months old, and likely an orphan, as no mother bear has been seen. He is apparently unafraid of people and happily takes strolls around the camp, drinking out of a container near the drilling sight and enjoying whatever treats workers offer him. Some of the workers are even getting ideas about the cub's employment prospects. "The guys from the drilling crew say: If we could teach him to roll pipes, we'd take him into the crew and all chip in on lunch," the employee said.